White Cloud has produced an outstanding level of quality, taste and precision when it comes to the e-cigarettes they sell. 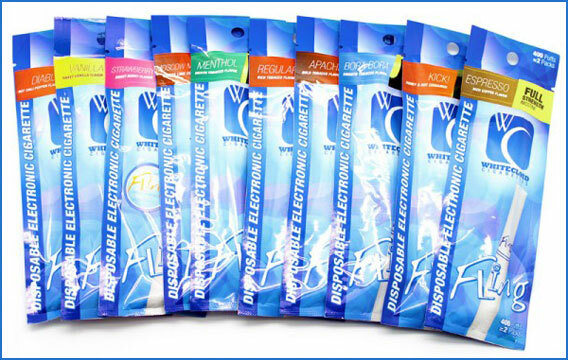 They tried to bring the same quality to the White Cloud Disposable electronic cigarette. 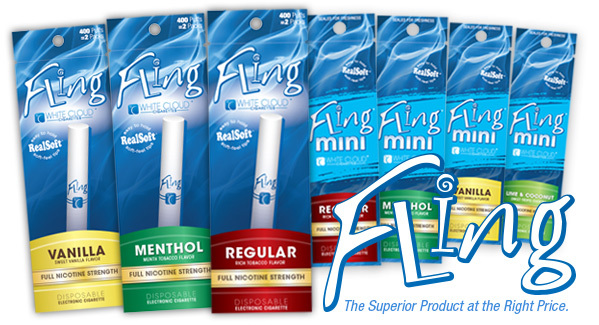 The ‘Fling’ – the name of the disposable – gives you the ability to satisfy your cravings without going down a whole new route at once. The cost of a starter kit can put many people off, so why not consider picking up the disposable equivalent instead? Well, the reason is that most disposables don’t cut it. They don’t often produce good vapor, but White Could Disposable Fling E-Cigarettes are possibly the best disposables on the market. To put it shortly, White Cloud disposable e-cigs are amazing and we really mean that! The majority of disposable e-cigarettes don’t provide an equal level of vapor compared to rechargeable models, but this White Cloud fling seems to be on the same level at the very least. Depending on what your tastes are and what you enjoy, you can pick up more than sixteen different flavours, so no matter what takes your fancy you can enjoy a far more relaxing smoking experience. That’s right 16 flavors available for their disposable line. 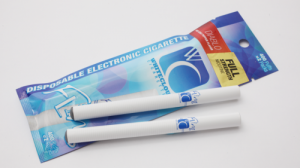 White Cloud knew they had a great product, and that selling all their flavors in disposable Fling e-cigs would become viable for them as customers do return to these. They come wrapped in vacuum sealed foil, which is much better for keeping freshness. Most brands offer disposables packaged inside plastic boxes, making them less eco-friendly and truthfully do not hold freshness nearly as well. Often, people complain about ‘duds’ or stale disposable e=-cigarettes and packaging might have a part in that. As far as nicotine strength, you have the choice between Full (2.4% or 24mg), Extra (3.6% or 36mg), or Double Extra (5.4% or 54mg) for those who enjoy a really strong ecig. White Cloud probably has the most options in terms of flavour and nicotine volume out of all disposable electronic cigs. However, it lacks the option for lighter user preferences in nicotine content. They last long enough, for someone like me who vapes heavily, I promise they will last for a good 350 puffs, while more modest vapers will attain 400 or more. 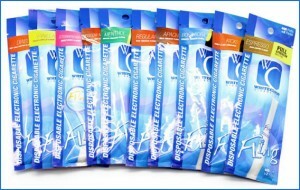 White Cloud smokeless disposable cigarettes all come with a soft tip mouth piece. The soft tip really feels similar to a traditional cigarette and is a popular feature among their client base. 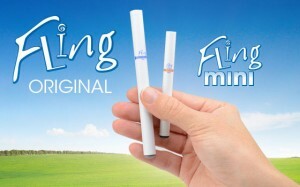 It gets better, White Cloud Disposable Fling e-cigs also come at a great price. 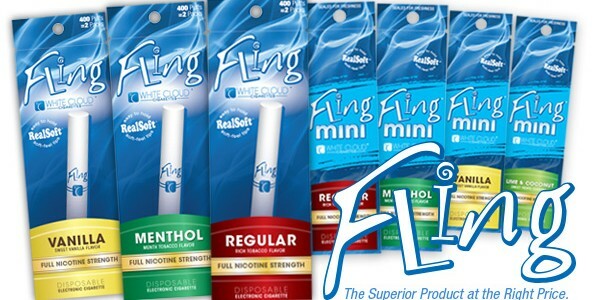 You can buy a regular fling for $4.46 on special or a Mini Fling for just $2.96 on special. The White Cloud Mini Fling offers the same performance but does not last for as many puffs. If that was not enough value, you can buy 5, 10, 25, 50 and 100 packs for additional savings. A 100 pack would costs $187.46 bringing the cost down to less than $2 per disposable Fling e-cig. It’s a hard to beat offer, considering that we rarely love a disposable as much as White Cloud. None of the reviewers have had a bad comment other than some flavors that we’re less enchanting than others. White Cloud e-cigarettes have been well received because they are well priced and always have a standard level of quality which is duly delivered. Although not being around for very long, they certainly have a highly skilled team that was able to create one of the best electronic cigarettes on the market this year. They we’re also voted best company to work for in Tampa Bay. We cover more of their great products on our full review, read more about White Cloud and find out if it’s the right e-cigarette for you. It is my personal favourite both in rechargeable and disposable models since discovering them and am happy to provide you this honest review. Anyone who tries them will not be disappointed.